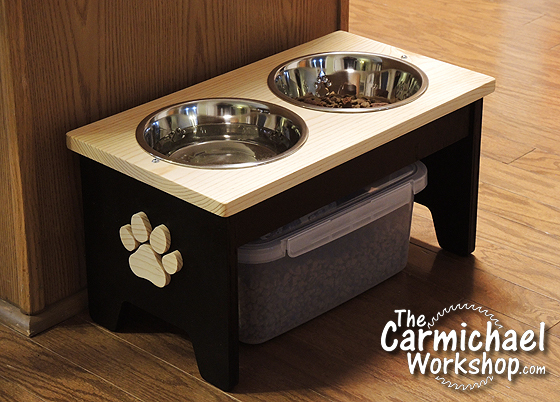 This raised Dog Food and Water Bowl Stand is an easy woodworking project that you can make in one or two days. I made this from regular 3/4" lumber from the home center. Check out the video and then make one for your pet! If you would like to make one of these yourself, click here to download my PDF plan. You may need to adjust the dimensions to fit your particular bowls and food container. Click here for dog bowls like the ones I used (affiliate link). Your dog is gonna love it! I made this Magazine Rack out of wood and clear acrylic. 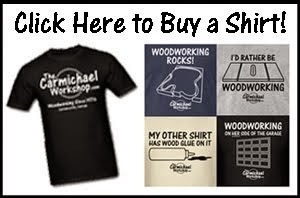 This is an easy woodworking project that would make a great gift for any avid reader. It only took a few hours and it's made completely from scrap materials I already had in the shop. I enjoy going into the shop with just an idea for a project and making it up as I go. If you've ever watched the American Pickers show, you've probably seen them talk about "Freestyling" where anything goes and you just wing it. 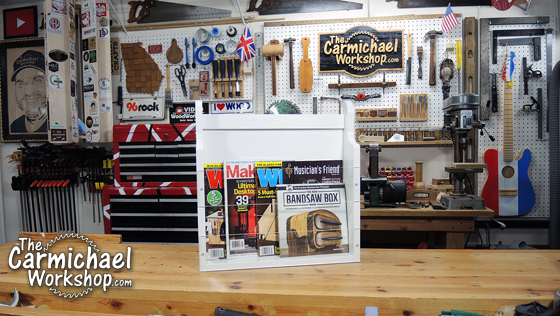 I did some freestyling to create this Magazine Rack out of leftover materials. It's going to look great in my library! Makers Rock Pink Floyd Album Cover Art and Giveaway! 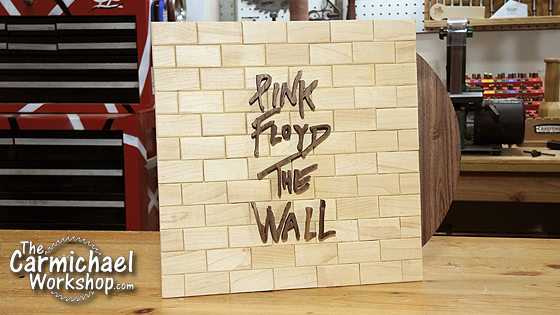 I recreated the album cover for Pink Floyd's The Wall using maple and walnut for the 2016 Makers Rock Album Art Collaboration with five of my YouTube friends. Check out the video of the project below, then enter my giveaway for the album art and a DIY Speaker Kit from Rockler Woodworking and Hardware! 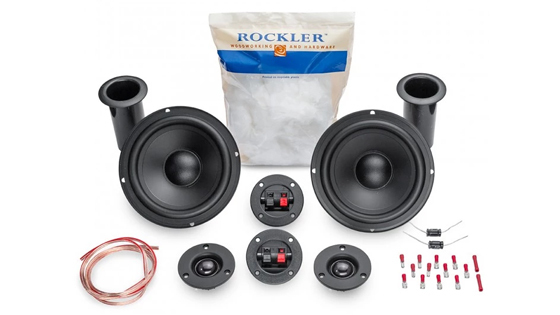 Here is a picture of the album art and Rocker DIY Speaker Kit bundle that will go to one winner. Enter to win in the Rafflecopter widget below. 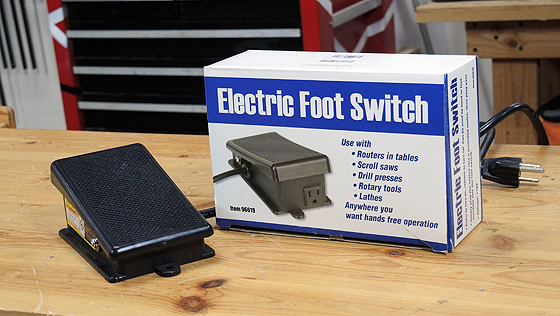 Thanks to Rockler for supporting our woodworking community and providing this awesome prize! Giveaway is open to legal residents of the 48 contiguous United States who are age 18 or older. The deadline to enter is Friday, October 28th at 11:59PM Pacific. The winner will be selected by random drawing on Saturday, October 29th and posted here with the Rafflecopter widget below. Watch all of the Makers Rock Album Art projects right here in one place! Be sure to subscribe to their channels and don't forget to enter their giveaways too! A group of us makers and woodworkers are remaking some of our favorite album covers! I'm making Pink Floyd's The Wall out of maple and walnut. We're also going to be giving them away! Check out this video for details about the Makers Rock Album Art Collaboration 2016, then watch for our projects on YouTube on Sunday, October 23rd! Subscribe to all of the makers below so you don't miss any of the Makers Rock Album Art projects! Rock on! I challenged myself to create an eBook of 10 Fun Scroll Saw Projects that you can cut out and assemble using interlocking joints - no glue, screws, or nails required - it's that simple! Check out my video featuring all ten projects, and if you like what you see, Click Here to purchase my eBook! It was a fun challenge trying to design these projects with slots that just slide together to assemble the project. I have a Dewalt DW788 Scroll Saw, but you could probably make these with a jigsaw and bandsaw as well. Most of the projects can be made in less than an hour so they don't take much time. 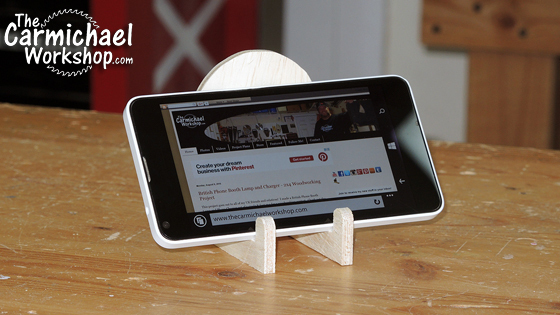 I started simple with this Phone Stand made from 1/4" plywood. It has two sides that hold your phone at different angles. 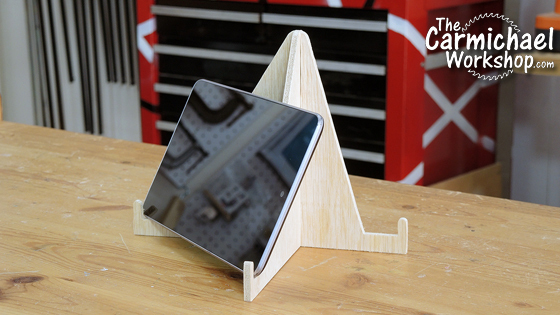 This Tablet Stand consists of only two pieces of 1/4" plywood. It is also two-sided for different angles. It will hold tablets that are 7" or larger. 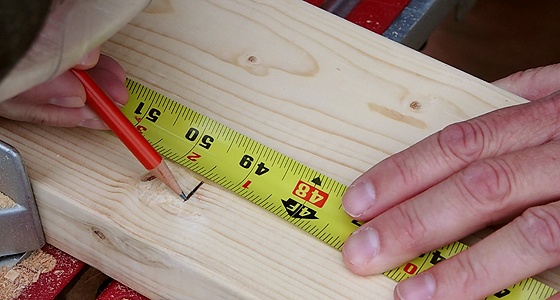 When making interlocking projects, it's important to measure the thickness of the wood so you know how wide to cut the slots. I needed a Laptop Stand that I could knock down and put in a laptop bag. This is made from 1/2" plywood and is sized to hold my 17.3" laptop. It's sturdy and has lots of ventilation. 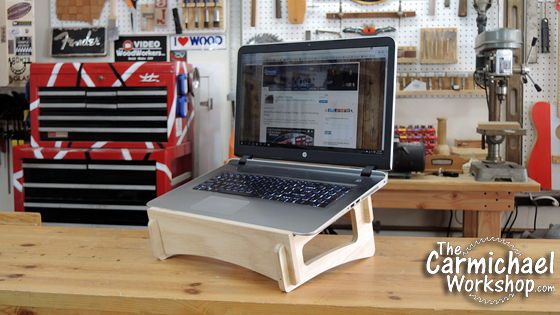 This project can be customized to fit other size laptops. 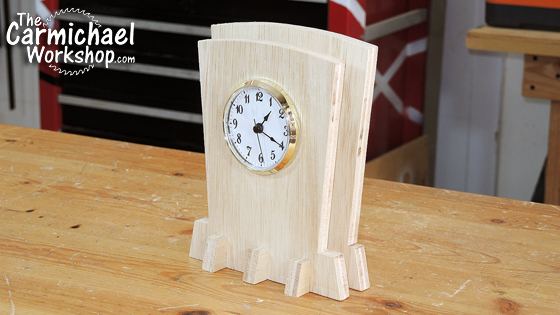 This Desk Clock made from 1/2" plywood would look great on any desk or mantle. It uses a 2-3/4" Clock Shoppe Insert. I really like the simplicity and art deco style of this design. I suggest buying the clock part before cutting the hole so you can measure for a perfect fit. 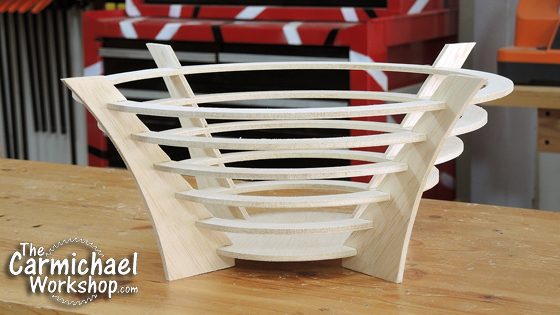 The 14-inch Basket is made from 1/4" plywood and would look great as a table centerpiece. You could also turn it upside down to use as a display stand. 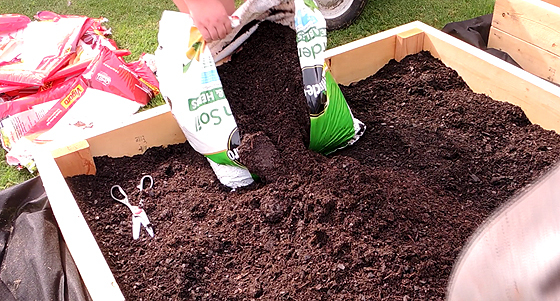 This project can be glued together, as it may come apart easily depending on what you put in it. Who doesn't need a drink tote for a 6-pack of soda or beer? This project is made from both 1/4" and 1/2" plywood. I suggest painting or finishing this one since it may get wet. This would make a great gift with someone's favorite drink. Speaking of which, I need to put something in mine. 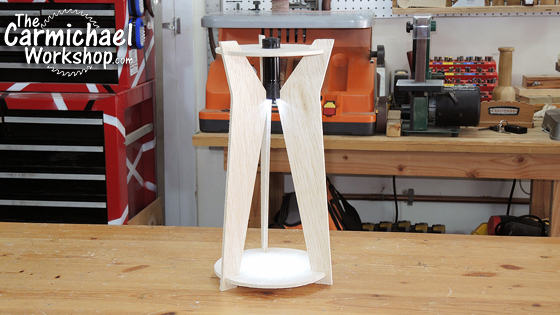 This Flashlight Lamp is made from 1/4" plywood and uses a Harbor Freight Flashlight as its light source. Any flashlight with a 1" diameter should fit. This design lends itself well for displaying something on the bottom shelf. If you are old like me, you might remember playing with balsa wood airplane kits. 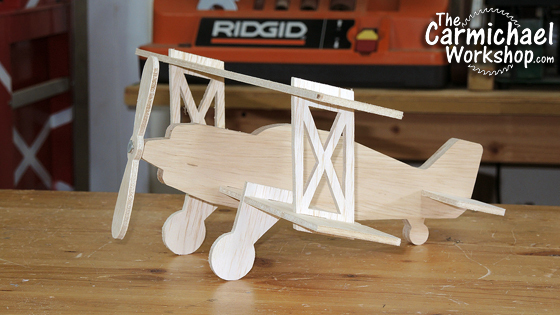 This Biplane will take you back to your childhood. The fuselage is cut from 1/2" plywood, and the rest of the parts are 1/4" plywood. It doesn't fly very well, but it looks pretty cool. Hang it from the ceiling with some string! 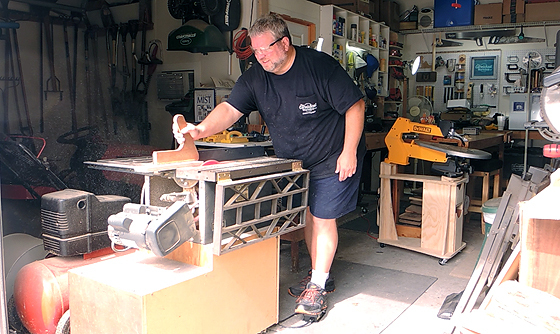 A woodworking eBook wouldn't be complete without a shop project. 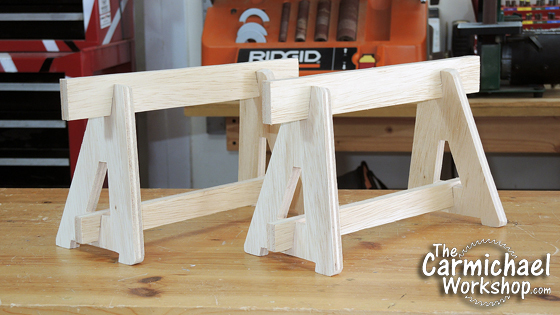 Make a pair of these Benchtop Sawhorses from 1/2" plywood. 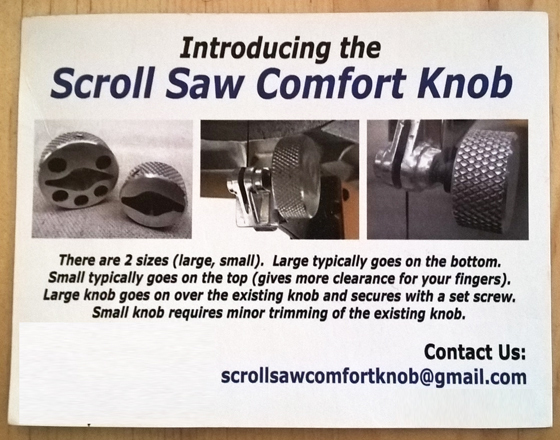 They are great for raising projects off the workbench for clamping or finishing. Take them apart and store them away when not in use. 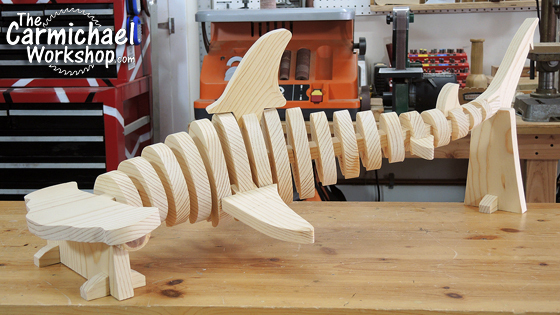 This Hammerhead Shark is 3 feet long and was lots of fun to make and see it come together. It's made from a pine 1x12, which is .75" thick. I wanted to do a large animal project, so this is what I came up with. Since sharks don't have legs, I made a couple of stands to hold it up. I think it turned out pretty awesome! Thanks for checking out my video and pictures of these projects. 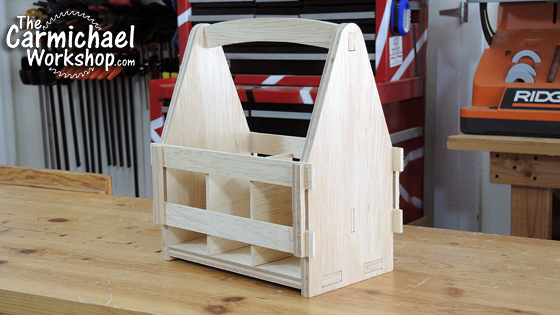 If you have a scroll saw, I hope these projects inspire you to dust it off and make some stuff. 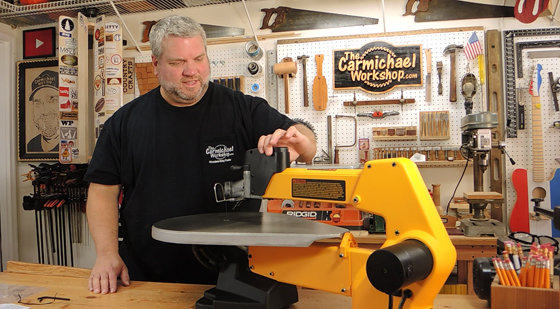 If you need help getting started, here is a link to my 10 Fun Scroll Saw Projects eBook. Contact me if you have any questions about these projects or how to build them. 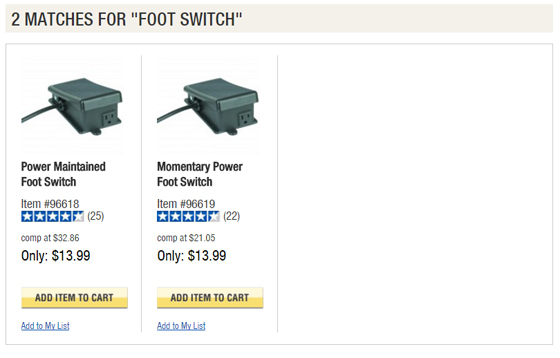 Did you know that using the affiliate links above to shop on Amazon helps to support my shop? Thank you for your support! This project goes out to all of my UK friends and relatives! 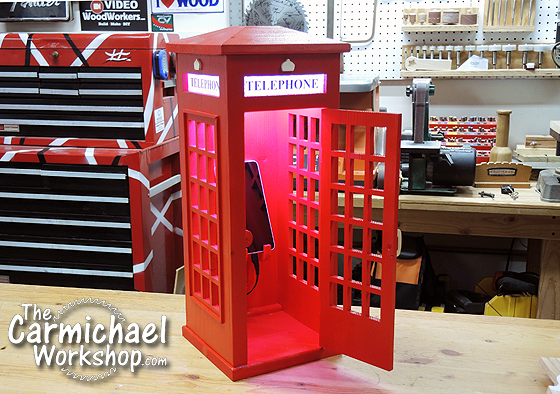 I made a British Phone Booth Lamp and Phone Charger out of a single 8-foot 2x4 for a woodworking contest. Check out the video below! I made this project for our local Gwinnett Woodworkers Association's 2x4 contest. There were lots of great entries this year. 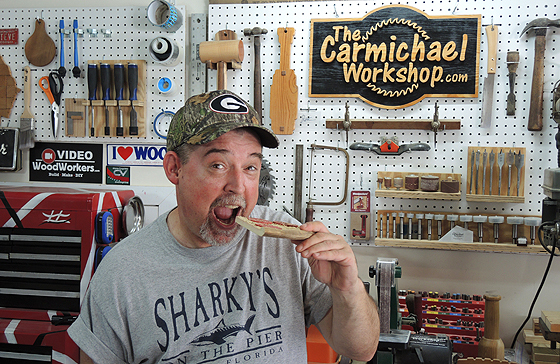 I got 3rd place and won a gift card for Peachtree Woodworking Supply. Below is a picture of the entries. 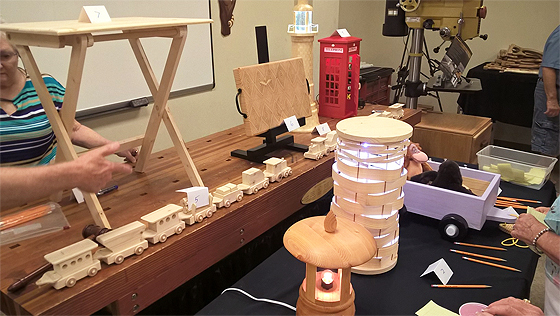 The amazing segmented Lighthouse woodturning won 1st place, and the folding TV Table won 2nd place! It was great to see everyone up their game this year!!! 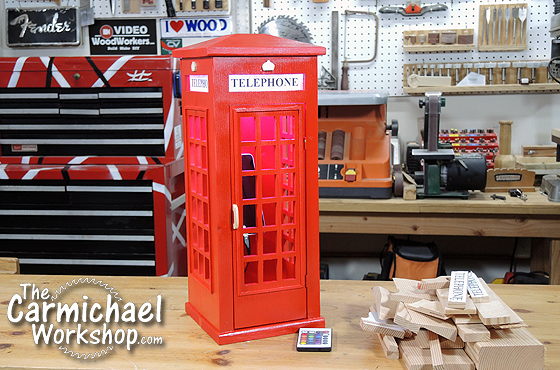 This phone booth will be easy to make if you are not limited to using a 2x4. It's basically just a box with windows and a door cut out of it. 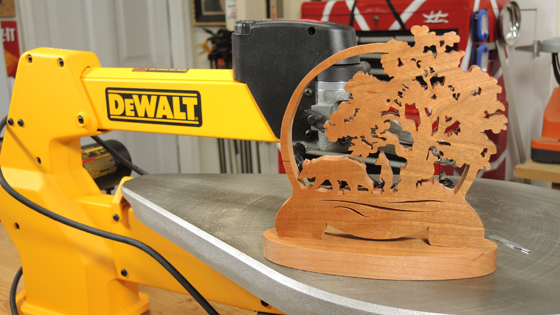 A scroll saw is a must for this project, but you could also make it with a CNC machine. 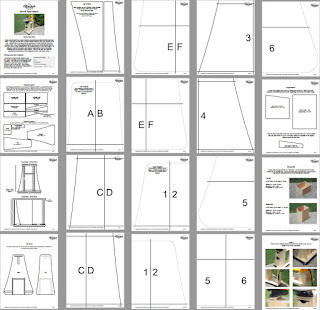 Click here to download my PDF cutting templates. The LED lights (affiliate link) really make the phone booth look awesome. My initial idea was to make it just a lamp. The phone charging station was kind of an afterthought, but it makes sense considering it does say "Telephone" on it. 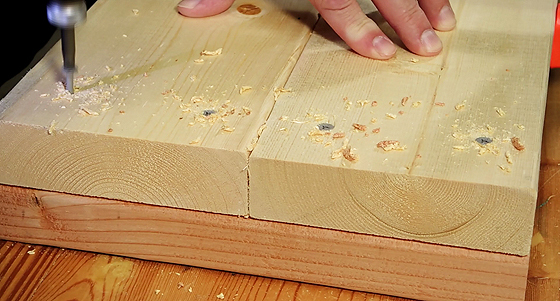 You should try to make something out of a single 2x4 sometime...it's a fun challenge! 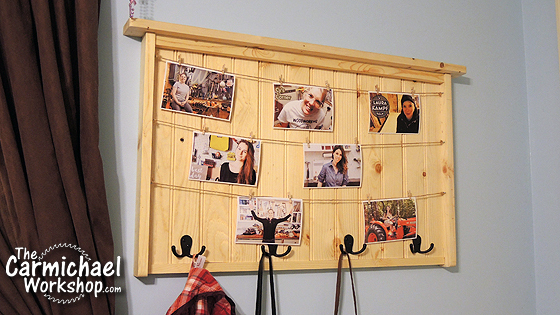 I combined two woodworking projects into one with this Twine Picture Frame & Coat Rack combo. I made it out of scrap wood that was left over from my previous Sliding Barn Door and Easy Wall Shelves projects. Check out the video below. I made this project for my daughter's room, so I took the opportunity to add some pictures of inspirational ladies in the DIY/Woodworking community to give her a little motivation to make stuff too. Visit these ladies and subscribe to their newsletters and YouTube channels! The next time you are planning to make a project, think about making it a combo! It's a great way to turn a small area into a multi-functional space. I was on the CNC with Dave Show! Thanks to Dave Gatton for inviting me to be the guest on his "CNC with Dave Show" on Saturday, July 16th. If you are interested in CNC machines, then you might want to tune into this show every Saturday night at 9pm on YouTube. 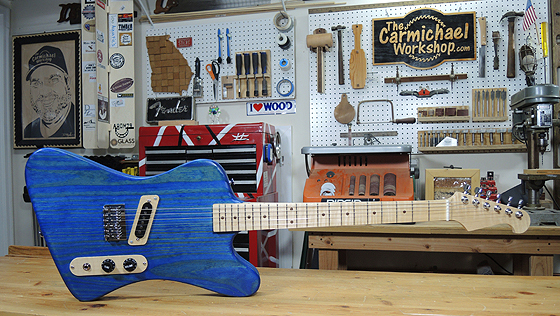 I talked about the Electric Guitar that I made with the Inventables X-Carve and you can watch the playback below. Thanks to all who watched, joined us in the chat room, and asked questions. I had a great time! Make Some Easy Wall Shelves! My daughter asked me to help her make some shelves for her room. 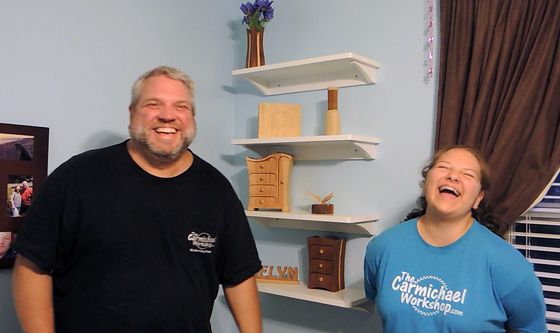 Watch us have some fun in the shop while making these Easy Wall Shelves that anyone can make. 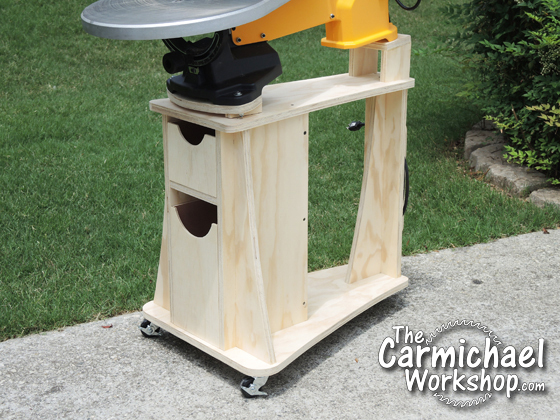 This is a great project for getting kids involved in woodworking. 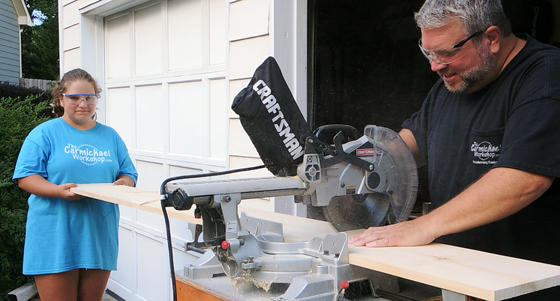 Going to the home center and picking out the wood is just as fun as making the project. Be sure to involve the kids in this initial step as well. Teach them look for defects and how to sight down a board to see if it is warped or twisted. It's easy to find examples of warped and twisted wood at the home center. Make sure you pick out good boards to avoid frustration during assembly. 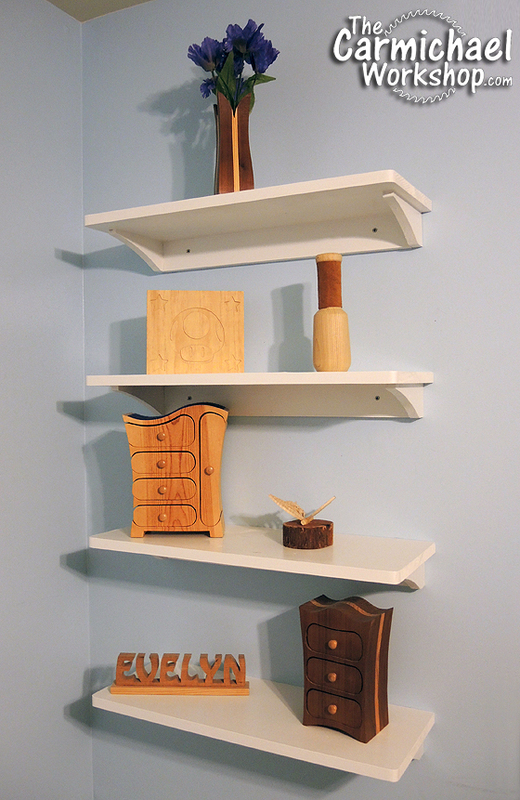 You can easily make these shelves while teaching a kid how to use a hand saw or jigsaw. Or, you can do like I did and cut all of the pieces for them, then let them glue them together and paint them. Each child is different, so use common sense and good judgement to determine when they are ready to use dangerous tools. 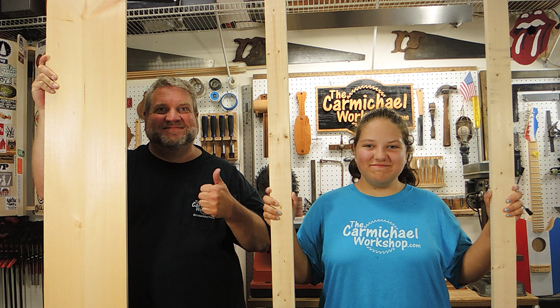 There are many other ways for kids to help in the shop. I encourage you to involve kids in the design process as well, but if you would like to use our design, click here to download the free plan. We were able to make four shelves using one 1x10 and two 1x3's. Make sure you attach them securely to the wall by screwing into studs or wall anchors. When working with kids in the shop, the most important thing is to have fun. You want them to have a good time. Tell jokes, talk about family history, talk about the future, listen to them, and laugh a lot. I know you will end up with a lot more than just a cool project out of the experience! My neighbor asked me to build a pair of Sliding Barn Doors for his living room/office doorway. Check out my video below to see how I made them. These are the supplies I used to build and install the barn doors. The key to building these doors is lots of planning and measuring. You may need different supplies depending on the size and of your doors and how they will be installed, so adjust this list to fit your needs. 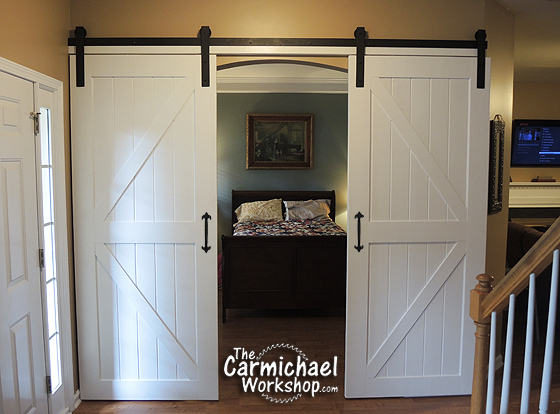 Here are some basic instructions for building and installing one barn door. Remember to make adjustments for your particular situation. Cut the 2x6 boards to length for the rails and stiles. 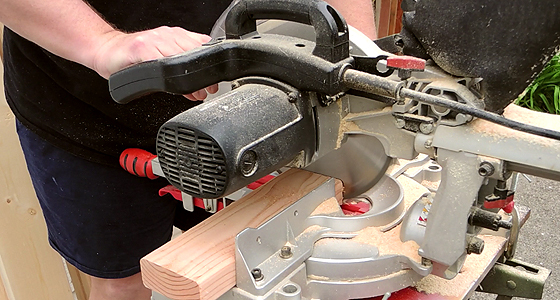 Use a 3/4" dado set to cut 1" deep grooves into one side of all 2x6 pieces. The middle rail will need a groove on both sides. Cut tenons on both ends of the rails. Do a dry assembly of the door frame to measure for the panels. Cut the tongue and groove planks for the panels. To center the groove lines in the panel opening, you can rip the sides off one plank and use those pieces to start and end the pattern. Glue the three rails into one stile and let it dry. Slide the tongue and groove planks into place. The planks I used are plain one side and have a center bead on the other side, so make sure the boards are flipped the right way. Start and end with the thin spacer boards so the grooves are centered. I did not use glue between the planks. Glue the remaining stile to the other side of the rails. Once the glue is dry, sand and paint or stain the doors as desired. Cut four 15" pieces of flat bar. Drill a hole at one end for the wheel. Drill two holes at the other end for mounting to door. Sand any rough edges. Cut a piece of flat bar for the track. In my case, the wall space limited the track to 107" long. In general, the track will usually need to be about twice the width of the door(s). 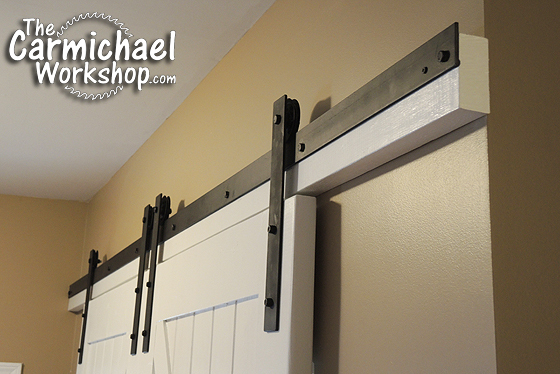 Paint the steel flat bar pieces and mounting hardware flat black. Mount the wheels to the top of the door using the 15" flat bar pieces. 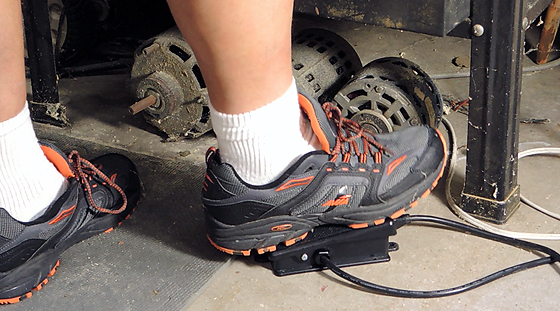 Make sure there is enough space between the top of the door and the bottom of the wheel to fit it onto the track. Cut the 2x4 board to the same length as the track. Mount the track to the 2x4 board using three screws, so that it overlaps the edge about 3/8" to allow clearance for the wheels to sit on the rail. Check above the door opening for a solid header or stud locations. Drill mounting holes through the track and 2x4 for the lag screws. Screw the track into place. Make sure it is sturdy because these doors are heavy. Hang the doors onto the rail. Make sure they clear door trim and baseboards and hang straight and square. You can make minor adjustments to crooked doors by slightly enlarging the wheel mounting holes and mounting the wheels a little higher or lower. Too keep a door from rolling off the end of the track, add an L bracket or strategically placed screw as a stop. If you do not want the doors to be able to swing out from the bottom, you can buy or make a bracket that will allow the doors to slide, but prevent them from swinging out. Enjoy your new barn doors! The supplies for this project cost about $200. 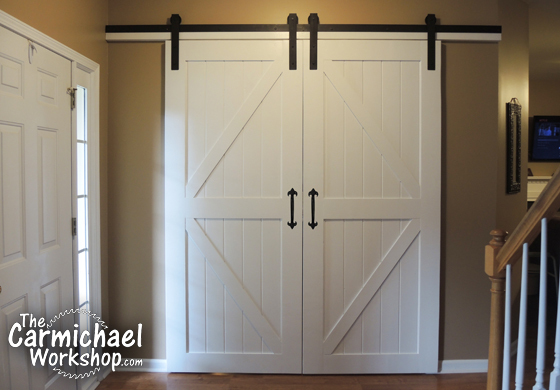 If you purchased similar barn doors and hardware from a store and paid for the installation, you could expect to spend about $1,500 or more, so you can save a lot of money by making and installing them yourself. It took me about 25 hours of work over the course of 1 week to complete this project. I am really pleased with out these barn doors turned out. 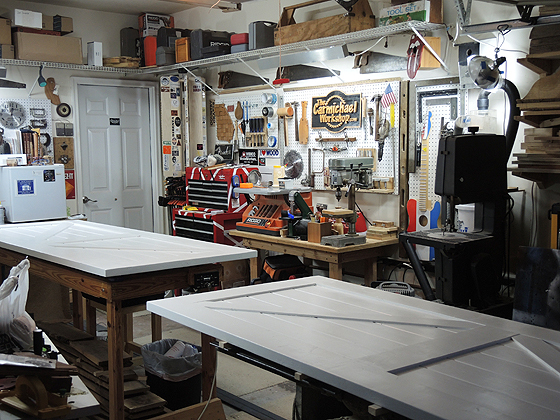 It was a challenging project to build such large doors in my small shop, but they were a lot of fun to make. My wife has already requested that I make some for our home, so that means I get some more shop time! Yes! April Wilkerson of WilkerDos.com made some barn doors from plywood siding. This is a great alternative to rail and stile construction. I liked the way she used regular materials for the mounting hardware. Check out her video below and subscribe to her channel if you haven't yet. Thanks April! Aaron at MrFixItDIY.com inspired me to use the rail and stile method to build these barn doors. Check out his video below and subscribe to his channel if you haven't yet. Thanks Aaron! 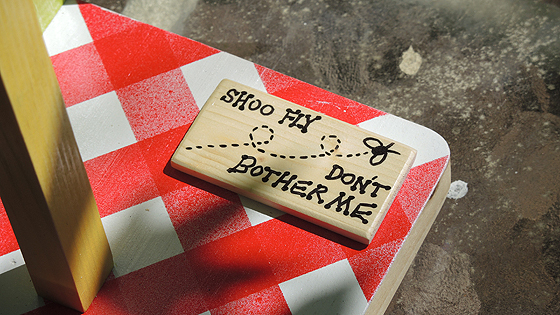 I made a "Shoo Fly Don't Bother Me" whirligig for our local woodworking club's whirligig contest that was held at our Spring picnic. 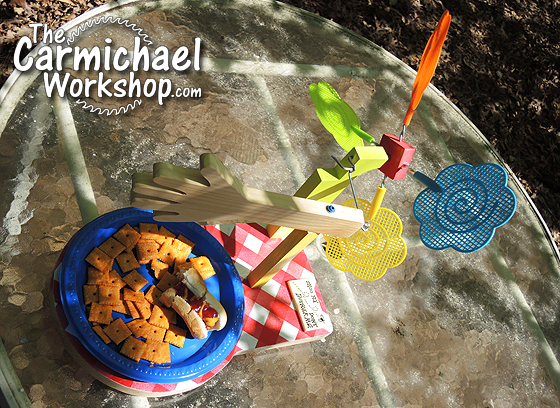 It was a beautiful day and the whirligig did a great job at keeping the flies away from my plate. 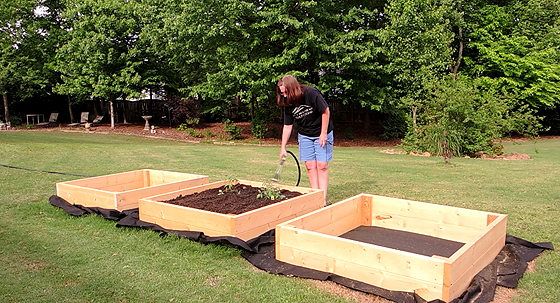 Watch this video of the build and see it in action! The propeller is made from fly swatters from the dollar store with the handles cut off. I made a red square hub out of wood and hot glued in the fly swatters. I used leftover wire from a fly swatter handle, an eye bolt, and a piece of straight 1/8" steel rod to make the action mechanism. I cut these with large wire cutters and bent them into shape with pliers. 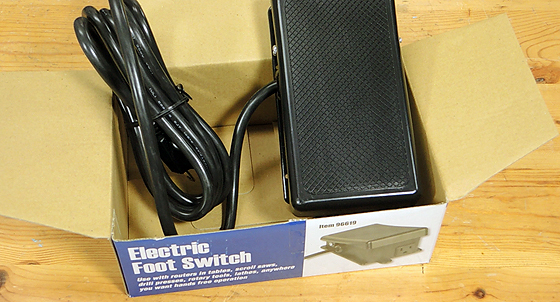 This takes a little fiddling to get it to work smoothly. I cut out the wooden parts, then drilled all of the holes prior to painting and assembly. 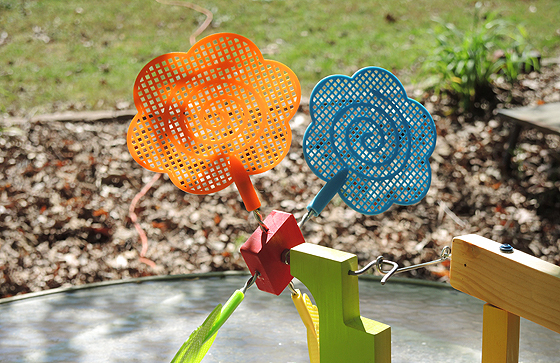 I think outdoor whirligig projects look best with a mix of bright colors. 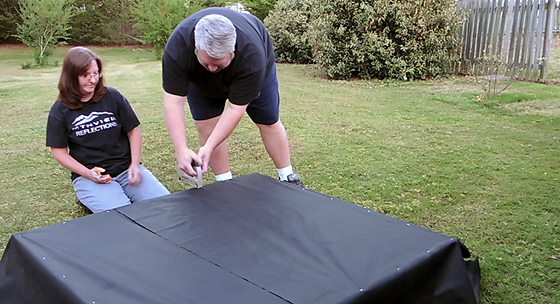 I was really happy with the table cloth pattern I got by masking off stripes and spraying light coats. I attached a small wooden name badge on the whirligig. Plus, the swinging hand keeps the flies away! 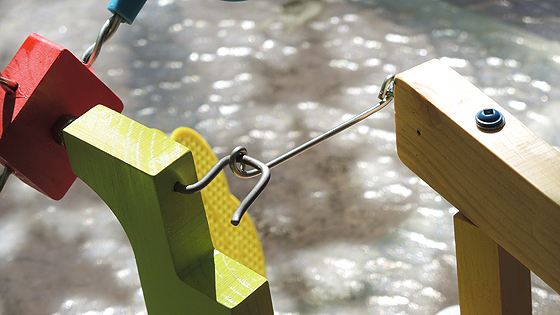 If you've never tried to make a whirligig before, you should definitely try it. They are fun to make with a big payoff when the wind starts blowing. 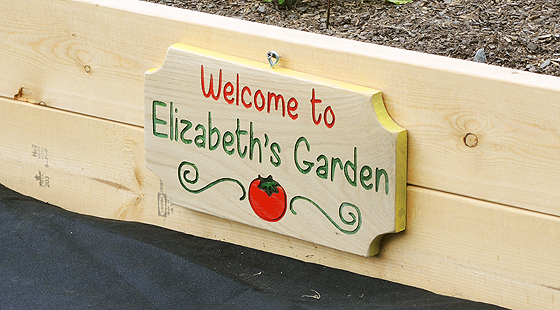 These are great projects for getting kids of all ages involved in woodworking. Have fun! The Woodworking Show in Atlanta was a blast! It was nice having the show in my home town. In this video I share some clips of the exhibitors, some selfies with other YouTube woodworkers, and pictures and video from about 25 people who visited my shop. 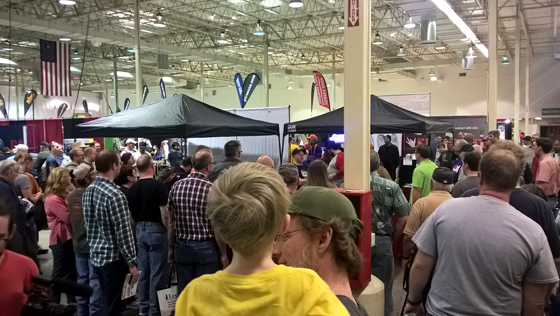 Here is a picture of the crowd at the Video Woodworkers booth. It was a pleasure meeting lots of other woodworkers and many people who watch my videos. 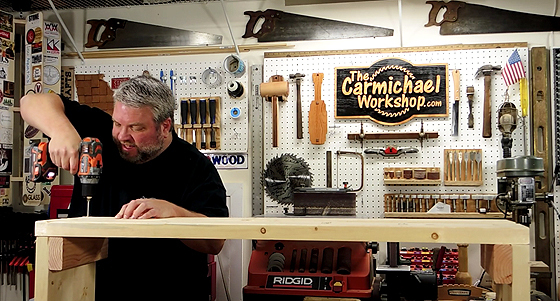 If you missed the show, I hope you can make it to the next one where the Video Woodworkers booth appears.